Home>Blog > Trending>Good Debt vs Bad Debt: Can Debt Be Good for You? Whether it’s student loans, your mortgage, a credit card balance, or car loan, you’ll find yourself with debt at some point. As you work to keep your debt in check and pay off your loans, it’s important to understand the concept of good debt vs. bad debt. Knowing the difference between the two will help you prioritize your debt repayment plan. While some loans can help your financial health in the long-term, others can quickly hurt it. Here are a few examples of good debt and bad debt that you might be carrying. Good debt is represented by the loans that help you generate income or increase your net worth. For example, a mortgage or real estate loan allows you to build equity in a home, which increases your net worth over time. Student loans are another type of good debt, since your education can boost your future earning potential. According to Forbes.com, the average student from the Class of 2016 carries $37,172 in student loan debt. Although student loan balances can seem overwhelming, there is some benefit to them. Student loans are considered installment loans. Making installment payments in full and on time each month gives you an advantage — building your credit history and improving your credit score. Student loans can also decrease your taxable income. The interest you pay on student loans can be deducted on your federal tax return. Like student debt, your mortgage is an installment loan and the interest you pay can also be tax-deductible. 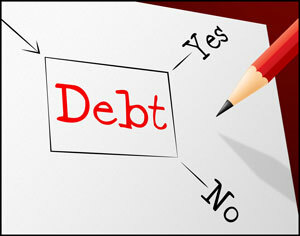 Mortgage products vary and the type of mortgage you have will determine if it is an example of good debt or bad debt. A fixed-rate loan has set payments that won’t change over time, which makes repayment easier. An adjustable-rate mortgage can be more challenging. After the fixed-rate introductory period ends, your interest rate and payment may increase. Non-conventional mortgages, including balloon mortgages and interest-only mortgages, can become harmful to your financial health after their initial benefits are gone. Bad debt, on the other hand, does not work toward increasing your net worth. Credit cards and personal loans are examples, because the money and interest you pay don’t necessarily increase your equity or improve your overall financial situation. A credit card is a revolving line of credit and you can use as much credit as you want up to the card limit. However, if you overuse a card and cannot pay back your monthly balance in full, your credit score can take a hit. Additionally, credit cards typically carry double-digit interest rates, which means keeping an outstanding balance on your card means paying thousands of dollars in interest over time. According to Magnify Money, the average card balance owed in 2018 was $6,348. Auto loans can be a bit of “gray area” in the good debt vs. bad debt debate. Like other installment loans, they can be beneficial to your credit score. However, your car will depreciate with time and use. An auto loan turns into an example of bad debt when you end up owing more on your loan than the car is worth. This happens when you are not required to make a down payment, or when you choose a loan with lower monthly payments over a longer loan term (six or more years). What’s your balance of good debt vs. bad debt? Talk to a Diamond loan consultant about a Loan Health Check-up. Through this convenient service, Diamond account specialists will ensure that you’re educated about your loans and credit report and offer options for financial soundness.